With the Hardware & Building Traders (HBT) group topping 600 members this month, and growing by over 100 members in just 12 months, many in the industry are asking – how do they do it? When posed with the question during the HBT 2016 National Conference held in Townsville mid-May, group manager Tim Starkey said the group’s success lies not only in the simplicity of the business model, but also the relaxed nature of the group. “This year it seems our newest members have commented on how enjoyable our conferences are, particularly our trade show – which stood at 117 suppliers this year – and how easy it is to do business in such a friendly and warm environment. Combine this with our minimal fees, it seems new members choose us because they need stability, as well as to be part of a group that does not require unnecessary costs,” Mr Starkey said. During the general conference session on the first morning of the conference, Mr Starkey presented an extensive industry overview, which included specifics on the group’s impressive membership growth. Mr Starkey said it had been an extraordinary six months and as of the beginning of May, HBT had 594 stores with 10 in the office in process. “Normally we see no new membership activity in December, because most of the independents are too busy to worry about talking to us. But we were booking up new members all the way until we closed on Christmas Eve. Again, nothing normally happens in January (in regards to new membership bookings) but when we came back it just kept going,” he said. “There are a lot of unhappy campers out there, whether they are in other groups looking for alternative solutions to their buying issues and we continue to be amazed at how many independent businesses there are out there, particularly timber merchants. We see those guys looking for an insurance policy for the future, particularly with all the change and all of the corporate activity that is going on in our industry,” Mr Starkey said. Mr Starkey said HBT’s industrial and tool division has had phenomenal growth in the last three years, reporting that the ITT group is now unequivocally the largest of the independent groups by membership numbers, in this division. 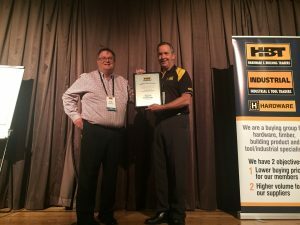 “Our industrial and tool division has grown very, very strongly over the last two to three years. In that market place, we see Total Tools as becoming increasingly aggressive and for the guys in this specialist space, they probably focus on Total Tools in the way that traditional hardware stores might be concerned about Bunnings,” he said. Mr Starkey also presented an extensive industry overview, during the general business sessions, beginning with Hydrox Holdings. “It is expected at the moment that Woolies will take Lowes out and then sell or dispose of each of Masters and HTH. There are quite a number of people looking at HTH and Masters or different components. Anchorage Capital Partners are having a look at it and are being advised by industry advisor, Geoff Dart,” he said. “It is still not clear if M10 are looking at all or only part of HTH. In the last few days the ACCC has written to industry participants, seeking their views on the effects of a merger. 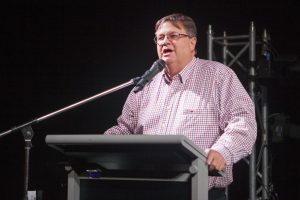 Obviously were these businesses to merge, then independent suppliers and independent hardware stores go from having two large independent wholesalers down to having one large independent wholesaler and that appears to be the issue that the ACCC is focusing on,” Mr Starkey said. Mr Starkey posed the several possibilities on the Masters’ sale, including the possibility that Lowes might take Masters out of the joint venture. “ACE Hardware now operates in many countries. They have a significant purchasing network out of China to feed their very successful US network of stores and their international operations. So it is interesting to note that ACE Hardware ran the ruler over Mitre 10 when Mitre 10 was having difficulties many years ago and the CEO of ACE Hardware was a keynote speaker at the Mitre 10 conference. I read somewhere that when Woolworths deal with Hydrox Holdings it should add about five per cent to its bottom line in terms of overall profit of the group – so interesting times,” Mr Starkey said. When looking at Mitre 10, Mr Starkey said it was difficult to acquire any numbers because the group does not segment below putting hardware and automotive together. “I think what is clear is a possible re-rationalisation of the wholesaling industry down to one major national independent wholesaler with significant product lines, is going to have some real implications for the independent retailers that need a warehouse to support them. But I also would think there would be a lot of suppliers who are wondering what that means for their future as well,” Mr Starkey said. Grand Champion Timber – Hume Doors and Timber – Patrick Antoine. 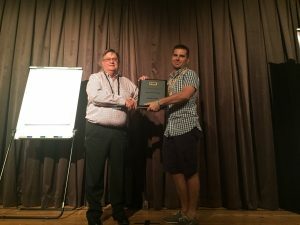 Growth Champion Timber – ITI Australia – Justin Newman. 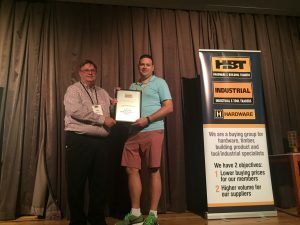 Grand Champion Hardware & Building – Macsim Fastenings – Ian Mathews. 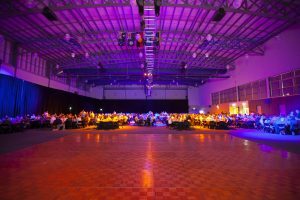 Growth Champion Hardware & Building – River Sands Pty. Ltd. – Kim Runje. 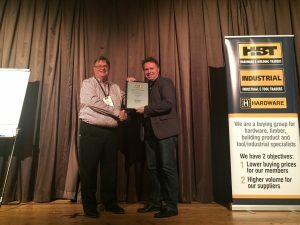 The Supplier of the Year Awards were also presented on the morning of the general business sessions with the awards divided into four categories: Grand Champion in Timber, Growth Champion in Timber, Grand Champion Hardware & Building and Growth Champion in Hardware & Building. The awards were selected from amongst the suppliers who choose to participate in HBT’s Supplier Support Program and are voted upon and nominated by members. “There were 68 nominations shared by 22 suppliers, then shortlisted suppliers who had more than three nominations from members and we looked at issues such as support for conferences, growth in business volume and general support for the aims of the group,” Mr Starkey said. 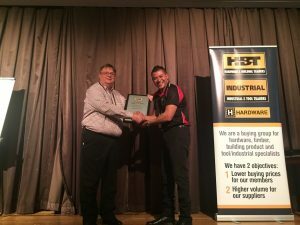 Store of the Year Awards were then presented, with two store awards presented during the morning, including traditional HBT Store of the Year award and the first Store of the Year Award to be presented to an Industrial and Tool Trader (ITT) member. 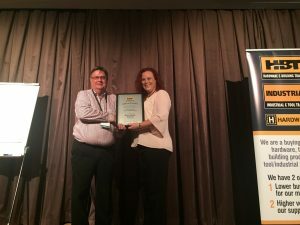 HBT Store of the Year – Herbert Hall, Charters Towers QLD – Chris Nelson. ITT Store of the Year – Cost Less Bolts & Industrial Supplies. Herbert Hall was awarded HBT Store of the Year after it had massively increased its support of the group, according to Mr Starkey. “This store has remained extremely positive with suppliers, has shown great growth in-store, attended all the conferences, while also strongly representing HBT to suppliers,” he said. Cost Less Bolts & Industrial Supplies was the first store to win the ITT Store of the Year award, with Mr Starkey saying these members had been instrumental in helping the ITT group get up and running. “Cost Less Bolts Supplies got a lot of members together in the early years and got them talking to us. They have helped to persuade a lot of suppliers to support us and are incredibly positive,” Mr Starkey said. HBT introduced several new initiatives at the conference, including a new website with a fresh new look. New features of the website include allowing members to search for products more easily, with category rationalisation a focal point, as well as being more mobile friendly. A new trailer promotion is also being run currently, with HBT customers given the chance to win one of six trailer give-aways, filled with goodies, with each total package worth around $14k. Next year’s promotion will offer over $68k in prizes including a jet-ski and 4WD buggy, aimed specifically at tradies looking to win a prize that they may not be able to afford themselves. The three major, high value prizes, run later in the year but for a longer period of time, and will be drawn early 2017. Late next year, the group has aimed even higher with a new Ford Mustang up for grabs for HBT customers. A new Key Supplier Program is also underway, which will highlight key suppliers in each category or sub-category. “The idea is that we will go to suppliers who we think support our members and invite them to be a key supplier in this program. And this will come with a package of costs and opportunities for being part of it. It’s a work in progress,” Mr Starkey said. A core program specific to H Hardware has also been launched including new marketing rebates, marketing material, with every H Store experiencing positive growth since changing over, according to Mr Starkey. A new home branded product for the group is also now underway, according to manager of member services, Aimee Innes, who said the home product will be available in several different categories and will be available to all members. One of the major announcements to be made at the conference, was HBT’s recent sponsorship of the McGrath Foundation at the beginning of May. “The intention going forward is to structure these in-store promotions around this sponsorship arrangement. The foundation’s work tracks highly among the demographics of our member’s customers, with men relating to it because of the Glenn McGrath connection – and they say a trade related, hardware related demographic is absolutely spot on,” Mr Starkey said. “The foundation’s main focus is to place a breast care nurse in a locality, but it costs around $140k for one nurse and they will not place a nurse unless they are confident that they have the funding for three years. We are the only hardware organisation in Australia that has a partnership with the McGrath foundation, which gives our members a serious point of difference,” he said. Starting in July, store events, incorporated with in-store sales, will be run with exclusive pink product brought into HBT stores, along with a McGrath rebate. HBT also touched on the digital world throughout the conference, frequently highlighting to members on how to use digital platforms to evolve their businesses. Manager of member services, Aimee Innes said that $278 million was spent online last year in the hardware industry alone, with tools and equipment the dominating product and no major player in the online space at the moment. Charles Nicolson from Vesta presented an extensive presentation on the importance of online visibility and what is known as endless aisles. “One of the big advantages of the big green boxes is that they have got a large number of SKUs. Online, you have the ability to actually display as many SKUs as one of those big box stores. If customers come into store and you have several products on the shelves, as well as other products that you can get in quite easily, you can just as easily take all those products and make them visible to your customers online,” Charles said. “Your customers don’t go and buy their new decking timber on the internet and hope something of good quality turns up. Your customers want to make sure it looks good before they’re going to spend all the money, right? Webrooming is something we see happen a lot in this industry, and it is something we can take advantage of because it helps us get that foot traffic in the door, to then carry on with business as we do day to day,” he said. Webrooming allows retailers to send requests through to their suppliers, so that suppliers can deliver information against those requests and retailers can quickly and easily fill those shelves. “By providing this platform, you can now get that information quickly, for several thousand, up to tens of thousands of SKUs for your digital shelves. And you’re not going to lose that face to face contact with your customers. If anything, you’re going to get more of it because at the end of the day, they will come into the store after researching the product online,” Charles said. Webrooming now accounts for 36 cents of every dollar that is spent in store, according to Charles, who said this is why it is so powerful for retailers. “When you think about every dollar that goes through your till every day, think about the fact that 36 cents of every one of those dollars has in some way been influenced online before people come into your store. If you don’t have that online visibility, then where is that 36 cents coming from? A supplier’s website maybe, if you’re lucky? So by getting that online visibility, you are driving that 36 cents in your direction,” he said. Seeing this opportunity, Charles said Vesta have developed a product distribution platform called Vesta Central. “Webrooming is by far the top sales method in the timber and hardware space. We want to keep working with the group and keep driving this so that we can build a stronger online presence across the HBT group,” Charles said. The gala dinner was a night of excitement for HBT members, particularly when the traditional cash prizes were awarded. The first prize to be awarded was for the Haymes Paint promotion, which was a getaway to the El Questro station in the Kimberley of WA, including airfares, accommodation, $1,000 towards meals and $2,500 spending money, presented by Matt Haymes. Kent’s H Hardware, Dave and Joan Kent, said they started supporting Haymes Paints a few years ago mainly because Haymes supported the independents so well. Suppliers also contributed to the yearly cash prizes awarded to members on the night, via the Supplier Support Program combined with HBT’s contribution, totalling $87,374.43. Dinner guests were then entertained with Tom Berger who amazed the guests with his psychic powers. With the HBT group growing so rapidly it was expected that this would be the last national conference the group will hold in a rural town, with Sydney ear marked for the 2017 conference.